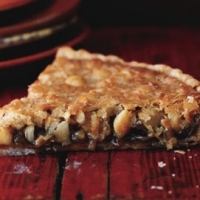 A sweet buttery filling packed with macadamia nuts and coconut. Similar to pecan pie. Roll out pie dough to fit into a 10" fluted tart pan. Chill shell until firm about 30 minutes. Lightly prick bottom of pie shell with a fork, then line with foil and fill with pie weights or raw rice. Bake until side is set and edge is pale golden, about 20 min. Carefully remove foil and weights and bake shell until deep golden, 10 to 15 minutes more. Whisk together eggs, brown sugar, vanilla and salt until combined, then whisk in melted butter, nuts and coconut. Pour filling into tart shell and bake until set in center, 25 to 30 min. Cool in pan on rack 30 minutes, then remove side of pan and cool tart to room temp, 1 1/2 to 2 hours more. May be baked in regular pie pan if desired. OMG wish I had a piece of this one right now, love it. You have another high 5 from me. Oh yum!! This sounds great!! We used to farm with Macadamia Nuts. Great recipe! Like juliecake's recipes? Never miss an upload!